It's summer, 1976. We are rehearsing in the new Naropa Assembly Hall at 1111 Pearl Street. I love this photograph by Robert Del Tradici. The light is rich and revealing, streaming in the open windows. Across 10th Street you an see the windows of the Boulder Ballet Academy studio. I would take class there, one of the longest practices of my life. In the past THIS ROOM has been a social dance hall, a photographer's studio, the shrine room for the Vajradhatu Buddhist community. Naropa will inhabit the space for about 6 years then move in 1982 to 2130 Arapahoe Avenue. Sometime in the '90's David Bolduc will turn it into the Boulder Bookstore. So it was a full circle to come here for the first book reading from This Very Moment event in October 2015. It was a vision as I lay in yoga class this morning. Lie under a tree was the instruction. I gather Allies; red checkered tablecloth to lie on, neck pillow, Ondaatje novel I'm reading and a book about walking, standing, sitting and lying down and, after months of it just hanging out over there somewhere in the dining room, my notebook. I get a salad from Noodles & Co. and imagine a coffee later from that little Country Store at Chautauqua Park. That's where I 'see' all this happening, this restingrestingresting after book and retirement. I am in retrograde. I am waiting, listening, allowing, wondering, hoping to keep the little monster thoughts from taking over. I so miss the kinesthetic acruity. Lineage was introduced to me in 1976 by Chogyam Trungpa Rinpoche when HH Karmapa was coming to Boulder for the first time. We learned the names of Buddhist teachers in the Kagyu lineage going back in time. Each one had presented a fresh view of the traditional Dharma and had taught the next generation. I was just beginning to shape the dance program at Naropa University and wondered about the art lineages, about my lineage as a mid twentieth century American modern dancer. I wanted students to reflect on their lineages, on what shaped their journey so they were here, at Naropa, in a dance class. I cut open a brown grocery bag, laid it flat on the dining room table and started to draw my first lineage tree. I still have it. The book is a variation on this theme of lineage. This photo shows students working on the Lineage Tree assignment in March, 2015, in a class taught by Jessica Cerullo, Naropa MFA in contemporary performance alumni. Carrying a spoonful of water. This instruction, from a handout at a meditation retreat, becomes the classroom practice of Carrying a Teaspoon of Water through Empty Space. How to feel the kinesthetic sensation of taut, then too taut, and then loose and too loose? How to coordinate and balance these sensations: attention to the water in the spoon and, at the same time, walking with the spoon of water across the room and placing it in a bowl on the floor? There are six bowls, three on each side of the room and three silver spoons. Each person goes at least twice. The second time is more playful and daring. Spilling happens. Someone has a cloth to wipe up the drops of water. We help one another experiment. What will happen when a dancer becomes a writer? How will she translate kinesthetic experiences of body mind to words on a page? In the classroom she can show one path for you to take. She can point to slow motion, for instance, as a ‘little discipline’ that helps tofind that sensation of body mind being together in the same field of awareness. Then of course, since everything changes, they move apart. But you must try this out for yourself, that's how it always works, hearing about how to do something then doing it and finding out what happens. 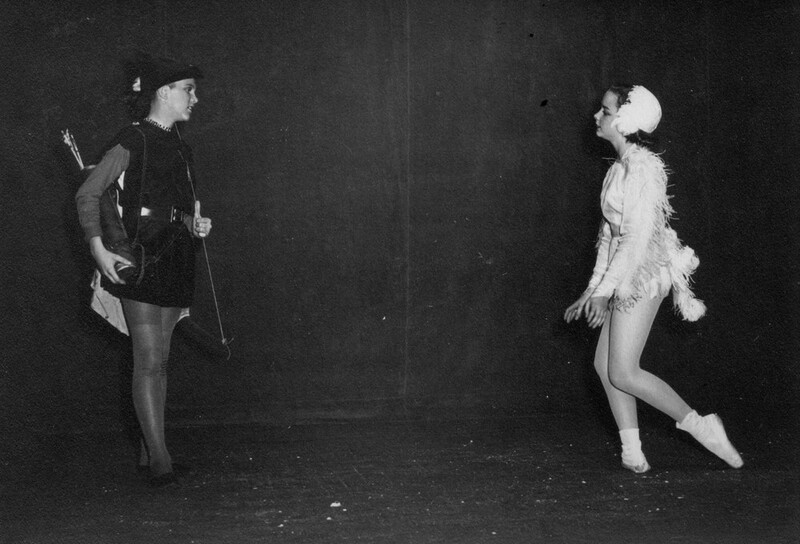 This photo is a portal back in time to Princton Ballet Society performances at McCarter theater. I am in high school and falling in love with ballet. Here I am a white bird, a swan I think. And there is a prince. (Who is he?) I am captivated by our connection, the way we are looking at one another, the way our heads tilt slightly and how the gaze is between us. Looking back through this photograph into this moment I wonder who this person is who was me. What is the balance between too much effort, doing without softness, and kinesthetic delight, that subtle sensation of rightness that is, maybe, indulgent? I find myself trying to be better, stronger, in less pain, be lovable. It’s effortful. Also I find myself working on what’s wrong. Kinesthetic delight feels different. When I find this delight, I sense relaxation with being alive, in the midst of effort, and everything changes. My training in classical ballet and Merce Cunningham technique required so much effort. And I loved it, this sensation of big trying and strong muscles. I loved showing up again and again for rigor and repetition. Then slowly slowly it became something I had to feel. I had to feel effort in order to feel any thing. Much later kinesthetic delight was revealed and offered a different way. Now the effort is to remember to come back to this very moment and find the gentle delight. “Once we stop rejecting the world, the world begins to pounce on us. Symbolism is imposed on us. Realizations and perceptions of all kinds of realities begin to take shape. There is symbolism right and left and front and back”. This slogan from the Shambhala Buddhist tradition is on a card that sits on a shelf above my kitchen sink. In the midst of busy mind chatter when I read this slogan it pulls me into the present. In dance improvisation when you’re standing there in your body mind, ready to dance, and mind starts to take over with that forceful busy-ness, what Trungpa Rinpoche calls 'subconscious gossip', remember this slogan. Then, suddenly you are back in the middle of the event. This is a part of the story about how I chose the title for the book, This Very Moment: teaching thinking dancing. Born on the southern tip of great lake Michigan in March 1938, before the United States declared war in Europe, before Pearl Harbor was bombed I find myself drawn to stories and images of the second world war. As I wander in memories for the Memoir, I sense/feel how this war surrounded my growing up. It was in an oblique way, in the language of the household, in the newspaper photos, in newsreels, in the fear that comes in the aftermath of war. I watch movies, TV series. I see young men thrown into tragic battles against the Axis of Hitler, Mussolini, Hirohito. I see this happening all over the world. I watch The Spies of Warsaw a TV series taking place during the year I was born. I watch the children. Why am I doing this? Will I find something I don't know the name of? If we are all interconnected does this war suffering explain sorrow? May wars cease and peace be in our breathing.